Dan and I have wanted to do this for a long time, and after much time, research, and effort, we did! We flew down to Pensacola, FL the day after Thanksgiving, and Jim was nice enough to pick us up from the airport and drive us to Camping World- they had the vehicle all detailed and ready to go. Rick gave us a very thorough and detailed walk-through- which was much needed because are RV rookies!! We learned what, where, and how everything works... between the two of us hopefully we'll remember everything! Here's what you've been waiting for: A PHOTO TOUR! She is a 31ft. Class C Motorhome...pretty big vehicle! The "cockpit" is large and comfy, which is awesome, but we are super excited about the "house" or the coach. 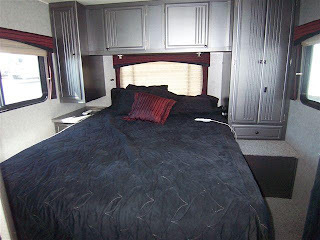 Above the cockpit is a queen-size cab bed... tons of space to sleep 2 people comfortably, or for storage. 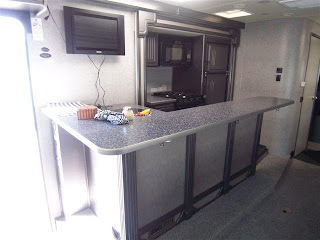 And YES, our RV has a BAR!! Instead of the standard "dinette" we opted for this sweet set-up! 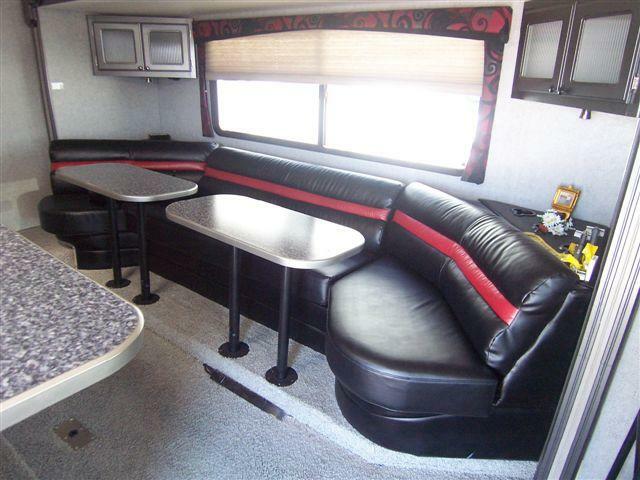 The large couch you see pictured also folds out into a full-sized bed, comfy enough for 2 people as well. The tables and barstools are easily removed and stored behind the couch. There are 2 "slide-outs" in the living room you see- they are both "out" in the photo. While driving, the kitchen is pushed up all the way to the bar (which folds down), and the couch goes up to about 12-18 inches away from the bar, leaving a little hallway to walk-through. We have a classy, larger-than-an-airplane bathroom as well! It is located right next to the kitchen near the back of the vehicle. Across the "hall" from the bathroom is the shower- it's big enough to work for us! :) It is also located sort-of within the bathroom... there is a curtain/door system implemented. The curtain goes around the shower all the way to the bathroom door. The bathroom door flips out and locks, creating a privacy area from the living room. I'll explain it some other time. Regardless, here's the shower and bedroom! WE ARE SO EXCITED!! What do we plan to do with it?? Um, camp? There are many parks within a short drive that would make for fun weekend trips! Triathlon races! No need to plan and pay for airfare and hotels far in advance... as long as we can find a campsite nearby, we are good to go! We've priced out several planned races, and even with gas prices nowadays, RV'ing is going to be significantly cheaper. 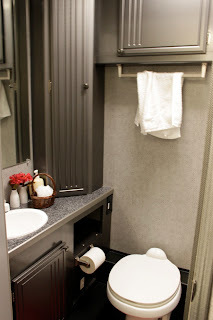 PLUS, Having our own bathroom and shower for pre- and post-race is going to be a.w.e.s.o.m.e. AND, post-race party at our place!! awning, shower, TV on the outside, BAR on the inside! Training weekends! It's going to be a blast to pick up and go and head for the hills (and better weather) whenever we please! 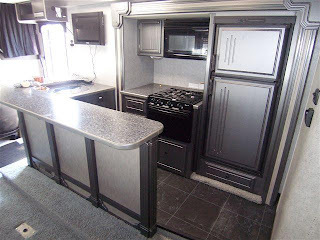 Tailgating- all the features of this RV- the bar, exterior entertainment center, awning, ice chest, etc. really LEND itself to a good time! 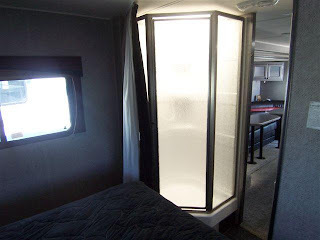 We LOVE traveling and visiting family/friends near and far, and RV'ing is going to be a FUN way to do it!! We look forward to a ton of new adventures!!! That is fing baller. LOVE IT! Very jealous LW. I honestly think this is the BEST thing ever. I told you on the phone Jerome and I wanted to do this in our 20s and we didn't....we should have...YOU guys will LOVE IT!!! ENJOY. "That there's an RV, Clark" Damn, that thing is sweet, congrats! that is SO cool! You are going to have a blast! That is so freaking awesome!!! Specially for races - perfect place for a post party! Nice set-up! That puts ours to shame. Have fun! I cannot let my husband see this! He has been wanting to get an RV for some time now! I am 100% against it ever being parked in our driveway! If he can pay to store it, I suppose he can have it. Looks like a blast though and super convenient for tri's!